Sizing your grow room dehumidifier correctly to keep your relative humidity in check. Here how to determine the right size for your setup and 3 of the best dehumidifier for grow Tent or grow Room. Are you thinking of growing plants indoor soon? Whether you just want to be an indoor horticulturist or winter is simply coming, there are a few things that you should keep in mind to be successful. Knowing the size of the indoor garden that will fit your needs and whether a grow tent or box would work best with what you want to grow is very important. One of the key items to be successful with indoor gardening is choosing the Right dehumidifier Size for your grow room or grow tent. A dehumidifier will help you control the humidity level in your grow area. This helps you make sure that your grow area will not have too much moisture to avoid any moisture-related conditions like root tot and mold. In this post, we’ll take a quick look at the three best dehumidifiers for grow tents or grow rooms. I’ll make sure to cover everything you want to know about Your Dehumidification Needs and the best brands I found on the market for different grow tent size. When I started to test growing plants indoors, I only had about five plants that didn’t need much watering. 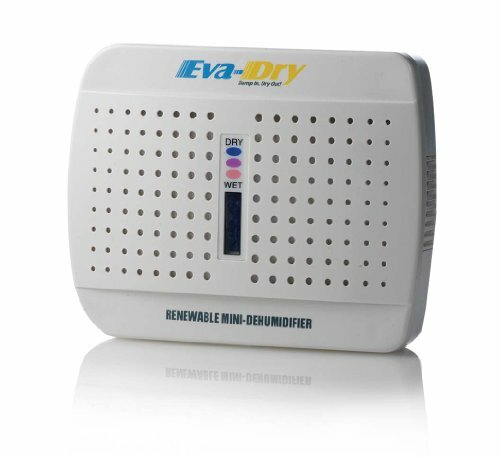 I used Eva-Dry E-333 Renewable Mini-Dehumidifier, and it worked wonderfully. It’s very remote as it doesn’t require any cords or even batteries to operate. Setting it up was effortless! Why Run A Dehumidifier in Grow Room? So why can we just grow plants indoors without having to get a dehumidifier? I’ve covered its basic use and purpose, which is for you to control humidity in your grow area and to avoid too much moisture in your space. If you’re wondering how it does that, well it’s simple. It basically pulls moisture from the air. The moisture it gets doesn’t just disappear, of course. Moisture gets stored in a pan or a container it comes with. So most likely, the bigger your humidifier is, the more storage for water it has. Some humidifiers do not need containers. Think of inverters when it comes to air conditioning. A dehumidifier of that type only has a tubing or two that could lead to a collection vessel or drainage. Some indoor growers even reuse the water they collected, which is smart because that could make them save more water. Having enough humidity level in your grow area is required since this will keep your plants healthy. If you try growing plants without trying to control your grow room’s humidity, you’ll most likely have plants with powdery mildew, a fungal disease. Another thing that could happen is a bud rot. It’s a type of mold that spreads and is only noticeable once it does. It usually hides and starts inside a bud. The bottom line is, if you don’t run a dehumidifier and not control your grow room’s temperature, you'll get too much moisture. It would make your air stale and destroy your plants. As the saying goes, prevention is better than cure. Once molds start to pest your indoor garden, it’s the same as starting all over again. The size of your grow room is significant for you to know how many dehumidifiers you need and where each of them should be placed. When it comes to knowing what your grow room needs, always consider how many plants you plan to grow. This'll let you know how much water you’ll need in a day and once you know more about that, you can quickly estimate the moisture and humidity level your room should have. Aside from considering how much moisture is needed by your grow tent or room, another thing to consider is the temperature management and whether you'll make use of CO2. For temperature management, it’s always good to keep the room at around 70-80°F. This range is good enough for growing most plants, including vegetables and fruit-bearing ones. Flowers would survive better in the higher range. CO2 enrichment can get a bit tricky, but this should also coincide with your dehumidifier. Having a high humidity level in your grow room will not work well with CO2 equipment. Lastly, humidity relies on where your grow area will be. If it’s somewhere isolated and cool, and you don’t plan to visit it a lot, additional allowance is no longer necessary. For a grow room that'll always have human heat, add at least 5 more points and another 5 if the room has the multiple ins and outs. Don’t worry about the calculation to know how big and how many dehumidifiers you should have as this is simple math. If a plant should receive a gallon of water a day, then a small grow room of 20 plants, require 20 gallons of water a day. This is a total of 120 pints of water input in a day since a gallon is equal to 8 pints. When spread in a day’s span, your grow room will need 5 pints of water an hour. A pint is equal to a pound of moisture, so a room with 20 plants needs 5 pounds of moisture an hour. Dehumidifier sizes are usually ranging from 30 up to 300 pints. The bigger the size is, of course, the more expensive it'll be. Since humidity and temperatures coincide, it’s best to get a dehumidifier that can efficiently function no matter what the temperature is. Keep in mind that the cooler your place is, the more likely that your dehumidifier can’t maximize its functionality. The size of your dehumidifier does depend on the number of plants and the size of your grow room, but if you want to get a big-sized dehumidifier, that’s also fine. It just means that you wouldn’t have to dispose of water more often. Industrial and residential dehumidifiers are both available for you, but if you've a small space, like let’s say a 4x4 grow tent, then you should be good with a residential dehumidifier. Now that you've an idea of what should work I your grow area when it comes to using dehumidifiers, as promised, I’ll share the best dehumidifiers out there. This'll help you get a better idea of what to get to start your indoor conquest. This work best if you've a grow tent or a room that’s not too big. Now its manufacturer claims that this mini device will work with an area that’s 333 square meters big but I’d say not really. This is best for 2x2 tents, so don’t get this if you plan on setting up a big garage as your indoor garden. It’s said to remove 4-6 ounces of humidity in 2-4 weeks. That’s pretty much an ounce or two a week, so again this is only good for a small grow tent or box. When it comes to how long it should last, I find it great. This piece is rechargeable. It doesn’t really work with batteries but let me explain further. This device works with a blue silica gel that serves as the moist absorber. This'll last about 4 weeks, depending on how damp the area is. Now don’t worry about how it only last for a month because true to its name that it is renewable, you just have to recharge it until the gel easily seen on its face turns pink. Amazingly, its manufacturer claims that you can keep this for ten years. This is ideal for growers who've a space of up to 1500 square meters. It has a built-in water tank with a 1.8L capacity. It’s an intelligent device that’s easy to turn on and off with just one button, so it’s safe to say it’s very user-friendly. This dehumidifier isn’t really as big as it sounds but the amount of moist and water it could extract may surprise you. It’s very compact and efficiently works in medium-sized grow areas. The good thing about this dehumidifier is that it comes with negative ion purification and activated carbon filter. This means that aside from extracting moisture, it also ensures that the air in your area will be clean. Best for small spaces like a 4x4 grow tent, this dehumidifier can draw up to 250ml of moisture in a day. It has an auto-shut feature once it reaches its capacity, so it works great if your grow area is even in your living room. What’s also great with this dehumidifier is how quiet and compact it is. This can set the relative humidity level of your space from 45%. Its LED indicator also lets you know if you should be worried whether water will be spilling out soon. If you don’t own a grow tent, as long as your space is no bigger than 220 square feet, you’re good. 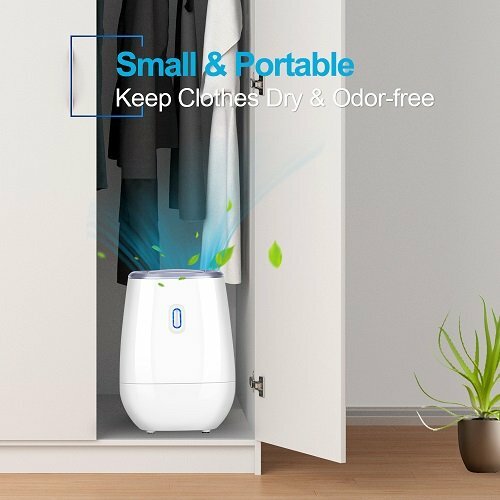 Because of how small this dehumidifier is, this is definitely not suitable for big spaces. If put in an area that’s bigger than a 4x4 tent, you most likely won’t see any improvement on the humidity level of your grow area. Ideally, if your grow area requires multiple dehumidifiers, they should be well-spaced. I've to stress that placing dehumidifiers on the right areas in your room or tent is really important to make sure that your plants benefit from what they are for in the first place. Putting it in the wrong area can affect your harvest if you'll be growing crops or the plants’ longevity in general. 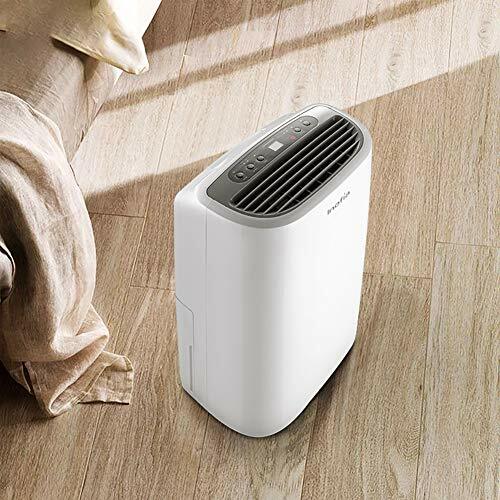 For reducing the room’s humidity, it’s always best to place the dehumidifier in the middle of the room on the same level as the lights especially if you only need one. With all the available types of dehumidifiers available, you can choose to have it hung that way or on the floor if your grow area’s ceiling is low. If you only have one dehumidifier and it’s in the middle of the room, then you shouldn’t have any issues when it comes to airflow. If you've multiple dehumidifiers, then just make sure that they do not go against the walls. Just remember to check your dehumidifier’s manual for the exact spacing instructions. What is the best setting for my dehumidifier? What should my humidity be during flowering? Since the ideal setting is around 30%-60%, during flowering, keep it in the middle of that range. Setting it to 40%-45% is best during this stage. A standard dehumidifier unit with a capacity of 30 pints mostly operates at 280 Watts/hour. If you’re going to run a dehumidifier the whole day, it should only cost you about 50 cents a day. So in a month, you only get to spend around $15-$16 for it. Just take note that if your place gets colder, the dehumidifier will most likely consume more power to extract moisture. Consider the area where you'll place your grow tent, room, or box. This means you've to check for temperature and humidity. The number of plants you'll grow is essential for knowing the performance of the dehumidifier you need. The location of your dehumidifier plays a crucial role in how efficiently it'll function.